Get stubborn carpet adhesive off your concrete subfloor with these simple methods to achieve the perfect surface for new flooring. Ripping up old carpeting is no small task, but removing the glue used to secure it to the subfloor is a major job all on its own. Creating a clean, smooth surface is critical, however, if a new adhesive is to form a tight bond between the new flooring and the subfloor. Pricey off-the-shelf products promise to make easy work of removing tough carpet glue from concrete, but chemical strippers emit toxic fumes while their eco-friendly counterparts can be so “green” that they’re ineffective. In the end, the manual method for removing carpet glue may be your best bet. Before moving forward take note: Carpet adhesives manufactured in the 1980s or earlier may contain asbestos, a known carcinogen. If you suspect the adhesive on your floor could contain asbestos, do not attempt to remove it yourself; contact an asbestos abatement professional. Scrape away as much glue as you can, using a scraper, sparkling knife, 5-in-1 tool or razor. Use steam or boiling water to soften the stubborn glue that refuses to budge. Switch to a reciprocating saw outfitted with a scraper blade, if necessary. Your first measure is to manually remove as much glue as you can with a scraping tool. While this may not banish every last bit of carpet glue from the floor, getting rid of as many large pieces as possible is a good starting point before moving on to other techniques for how to remove carpet glue. Use a paint scraper, spackling knife, 5-in-1 tool, or a razor blade—just be sure the tool has a handle with a comfortable grip. Wear flexible work gloves to spare your hands; knee pads are also advisable during what could otherwise be a painful chore. If you can’t conquer all the carpet glue with elbow grease alone, move on to heat, which will soften the dried adhesive, making it easier to scrape or scour away. There are two ways to approach this: with either boiling water or steam. After donning protective gloves (and waterproof work boots, or possibly rain boots, to protect your feet), heat and pour enough boiling water to completely cover the carpet glue and give it about five to 10 minutes to soften. When the glue starts to become pliable, use your scraper tool to work it out of the concrete. Work in small sections so that you can remove the softened carpet glue before the water cools. Sop up as much water as possible with a towel when finished to expedite drying. If the manual method fails to yield results, don’t despair. There are at least two additional tools that often prove effective for the task at hand. Consider using a portable steam cleaner—a tool that’s available for rent or purchase at your local home center. Direct the flow of steam a few inches away from the carpet glue until it is soft enough to scrape up. 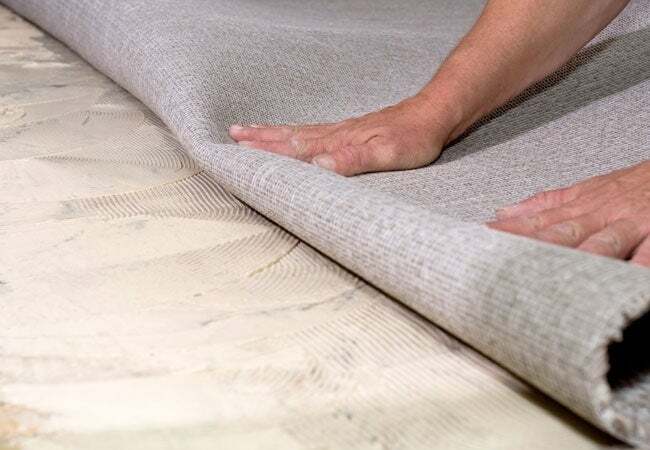 Here, too, alternate steaming and scraping small sections at a time so that you can lift up the carpet glue before it cools off and hardens once more. If dealing with a large area and/or particularly stubborn carpet glue, use your reciprocating saw fitted with a special scraper attachment to tackle the job. The reciprocating saw will drastically reduce the time spent scraping—the vibration of the blade does the tough work for you. Reciprocating saw scraper blades are available at most home improvement centers, as well as online, from manufacturers such as Spyder and Milwauke. A 2″- to 4″-wide blade should be appropriate for removing carpet glue).To use the scraper attachment, insert the blade into your reciprocating saw and lock it in place. If the scraper attachment has a beveled edge and a flat edge, position the blade so that the beveled edge faces the ceiling and flat edge faces the floor. Hold the saw at a low angle and start running it at half speed before building up to full speed. The carpet glue should lift right up!